On the web, we have a unique opportunity that doesn't exist with traditional, interruption marketing. We can not only generate, but also guide leads down our sales funnel and score them into a qualified lead that sales can work to close. This aspect is often overlooked with small businesses looking to generate leads online. It's just as important to help guide newly generated soft leads down your sales funnel based on where they are in the buyer's journey for your industry. Let's briefly talk about this notion of a buyer's journey and how it impacts the sales funnel. Every consumer, whether B2B or B2C has a common set of steps that they take from the time they identify that there's a problem or desire that they have to the time that they make an actual purchase. 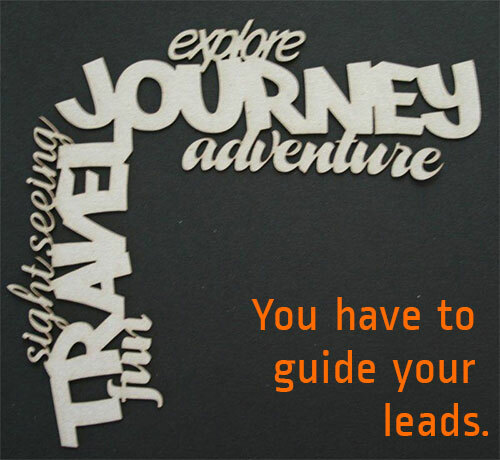 Inbound marketing allows us to market to our leads based on where they're at in the buyer's journey. I plan to write more detail on the buyer's journey in the future, but for now this simple explanation will suffice. We can often make some assumptions when a new lead is generated online as to where the lead is in the buyer's journey. For example, if the lead downloads an overview guide ebook from your website that is covers the general ideas around how to solve a problem they have, they are likely at the beginning of the buyer's journey. If this user converts into a lead, you can make some assumptions that this lead is at the beginning and could use some nurturing to move them down the funnel. The next time this early stage buyer visits your site, we could show them educational offers that start to get into more detail on picking the right solution for their problem, moving them closer to the purchase step in their buyer's journey. We may want to use email marketing to send them more educational offers that will help them move further down the funnel. The idea here is that we aren't just generating a lead and letting it develop however it wants to. We're helping guide leads down our sales funnel. Again, this is a unique attribute to Inbound Marketing. Are you able to dynamically play a radio ad to listeners based on where they are in the buyer's journey? Are you able to dynamically change ads in the newspaper or a magazine based on where the reader is in the buyer's journey? Ask this same question of any marketing effort outside of the web and the answer will be the same. No! Being able to target leads based on where they are in the buyer's journey and what they're specifically interested in tremendously increases your return and establishes you as an expert, thus making you the obvious solution to their problem.